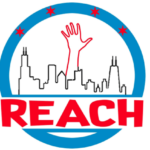 Reach is a social organizing platform to unite the community, expand social networks, and understand the true underlying issues of our local neighborhoods. We build community in two ways: uniting social networks through mutual interests, and partnering with local nonprofits to engage in their mission. Reach hosts social events that celebrate our partnership with featured nonprofits. The events unite and expand social networks, enhance Chicago’s ever-popular social culture, and introduce us to our nonprofit partners’ community missions, and how we as a united, active community can roll up our sleeves and engage with them. The goal of our platform is to provide simple opportunities to meet new groups of friends that can come together to learn about key community issues, and do our part however big or small to make a positive impact on the future of Chicago. Between our semi-annual events, we engage in volunteer and fundraising opportunities with our nonprofit partners in order to maximize our community impact. We strive to maintain a strong, united, active following that can together make our mark on the future of Chicago, and have fun doing so. This builds community, brings people together, and engages us in something bigger than ourselves on a consistent basis. The ask is simple: Join us, meet new friends, and dig some roots in our community. We are this city’s future, and we challenge everyone to learn, do your part, and have some fun in the process. Together, we can change the future of our Chicago community by actively engaging with these featured partners. Join the party and let’s have some fun. Start as a fan, do what you can, and our impact will expand.